NOTE: Scroll down to the last three paragraphs if you’re pressed for time and want to know why Argentina does medical care better than the United States. If you’re interested in the arresting tale of this bloody shirt, enjoy the ride. Last Saturday, Jon and I went to El Catedral de Almagro, a dimly-lit warehouse with antique furniture, high ceilings, and abstract artwork. The corrugated tin walls, barrel tables, and huge papier-mâché human heart suspended above the bar lent the space a unique vibe, and the tango-savvy crowd felt right at home. Every night, El Catedral invites people for lessons in the national dance of Argentina. Jon had promised that we’d learn before leaving Buenos Aires, and we’d loosened up our limbs with a couple of cheap bottles of wine before hitting the dance floor. A live band complete with an upright bass, a cello, an accordion, several guitars, and a piano took the stage just after 1:00 am. Parties in Argentina don’t get going until the early hours of the morning, as people are prone to eating dinner around 10:00 or 11:00 pm. Jon and I conversed with travelers from Switzerland and Germany, and the crowd began to thin out after the band finished around 2:15. We were across town from our apartment in Belgrano, but we had our bikes for us waiting outside. Traffic was sparse at this late hour and it was a balmy 80 degrees. We didn’t realize it at the time, but we started heading out in the wrong direction, and before long, Jon had gotten too far ahead of me on Rivadavia Avenue, a relatively busy thoroughfare with no bike lanes. I accepted that I was completely lost and figured I’d just meet Jon at home, asking passersby the general direction of Palermo, a neighborhood with which I was more familiar and felt confident I could navigate. After about 25 minutes of following the advice of these kind, inebriated strangers, I’d found a familiar path which I took all the way northwest, back to our Belgrano apartment. I walked in expecting to see Jon with his feet propped up on the table, maybe enjoying an episode of M*A*S*H* or a TED Talk on paranormal activity. To my surprise, the apartment was dark and empty. It was 3:15 am. I took a quick shower as relief from the heat and sticky exercise, and when I emerged, there was still no sign of Jon. The clock hit 3:45. I walked out onto our balcony to look up the street, and checked on a baby pigeon in a nest to the left of our bike storage area. As usual, the neighbor’s cat was eyeing the little bird, but had never mustered the courage to jump the gap which was two stories above the sidewalks below. I tried to read, but my mind kept drifting as I looked up and down the streets. By 4:30, I decided to check out the route from El Catedral on Google Maps. I’d figured he’d probably gotten a flat tire and had to walk the rest of the way. Once I determined that the entire journey was projected to take less than two hours on foot—and this was by the hypothetical “Google walker” who was no match for Jon’s rapid ambulation—I began to get worried. Ok, not just worried. I panicked. It was 5:15 and the sky was starting to get light, and there was still no sign of Jon. I ran downstairs to speak with the security guard of our building who tried to assuage my fears. We jointly made a plan to call the police at 7:00 am if Jon still hadn’t turned up. It was 6:10 and the sky was brightening. My imagination visited all of the usual dark places of an ambiguously bereaved (and hysterical) girlfriend. Accident. Robbery. Kidnapping. Senseless beating or murder. Leaning over the banister, I finally spotted a figure making haste toward our building. 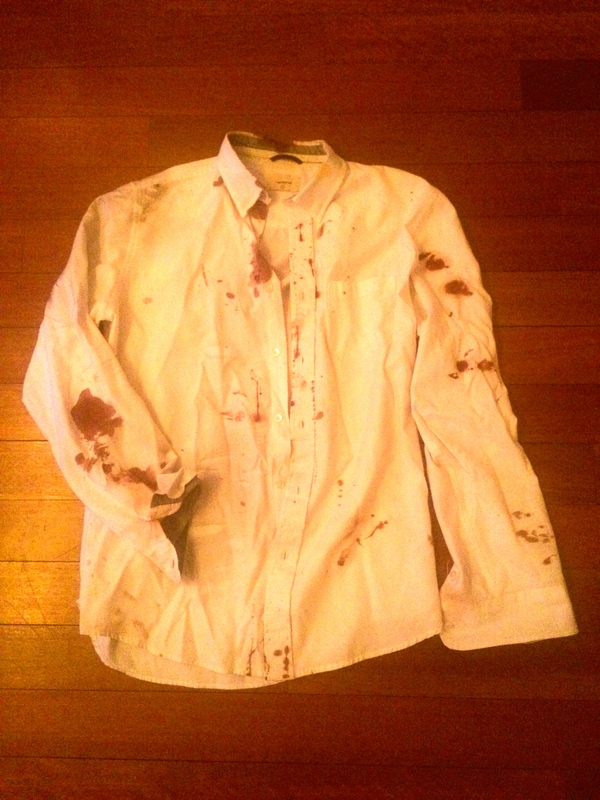 He was tall, wearing a blood-spattered white shirt, and walking a bike. I ran downstairs to meet him. Here’s what happened: after we’d gotten separated on the journey home, Jon had hit a pothole on his bike which threw him over the handlebars. His chin, taking the brunt of the impact, had split open as he hit the ground, and he also sprained his right wrist. His arms were covered with nasty cuts and contusions. Two witnesses called an ambulance which drove him to the hospital. When he arrived, medical staff asked for only two things: his name and his age. They stitched up his chin and treated his wounds for free. In the United States, this treatment could have cost him over $3,000. According to the New York Times, it can be over $2,000 for three stitches and around $1,000 for a short ambulance trip, a ride that was free 30 years ago, even when wounds aren’t life-threatening. In fact, if we were at home, I would have considered taking a needle and thread to him myself, or calling one of my friends who’s a doctor. That is not the kind of country we should be. Solution: This is a no-brainer. Medical care is something that everyone needs in their lives and shouldn’t be performed for outrageous profits. If a hospital in Argentina can give a man an ambulance ride and medical treatment for free, emergency rooms in the U.S. should be able to do the same. This isn’t a radical idea. It’s the humane thing to do. This entry was posted in Foreign Lands of Opportunity by Jocelyn. Bookmark the permalink.